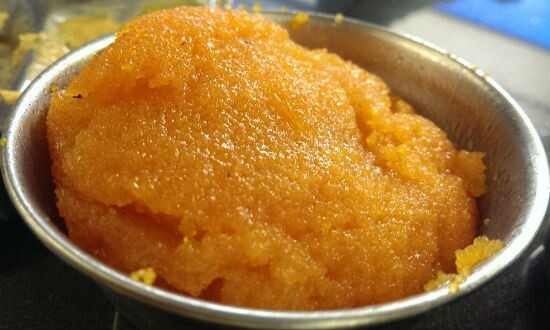 Kesari is a popular South Indian dessert sweet made during festive occasions. This variation uses pulp of musk melon and is equally tasty as the original. 1. Heat 1/4 cup of ghee in a pan over medium flame. 2. Fry the cashew nuts and raisins for a minute. 4. To the same pan, add the rava and roast until golden. 5. Add hot water and cook until the rava is tender and soft. 6. Add the sugar, musk melon pulp, cardamom powder and mix well. 8. Stir once or twice. Feel free to comment or share your thoughts on this Musk Melon Kesari Recipe from Awesome Cuisine.